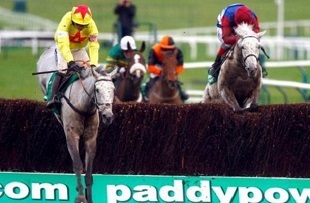 The Sky Bet Chase was formerly known as the Great Yorkshire Handicap and is a three mile race held at Doncaster. The going is certain to be on the soft side this year and it has attracted a field of 15 runners. The ante-post favourite for the race is Unioniste, a French-bred grey trained by Paul Nicholls. He is considered not far short of Gold Cup on his best form and will be partnered by 5lb claimer Harry Derham. In 2012, Derham rode Unioniste to win the valuable December Gold Cup at Cheltenham in very soft ground and this race looks ideal for him. After finishing a fair third at Wetherby, Unioniste put up an impressive display of jumping to win at Aintree. That victory convinced Nicholls to try him at the highest level but he could do no better than eighth place in the Grade 1 Lexus Chase in Ireland. With Derham reducing his weight to 11st 7lb, he looks to have a great opportunity to get back to winning ways. He stands out as the class horse of the race and looks a good bet at 9-2 with Bet365. Grand National winner Aurora’s Encore makes his second appearance of the season but may struggle in receipt of just a couple of pounds from Unioniste. Sue Smith’s gelding is now racing off an 11lb higher mark than when winning at Aintree and connections would be delighted if he could finish fourth or fifth. Donald McCain’s Kruzhlinin has won his last two starts at Kelso in good style and must have a chance with just a 6lbs rise. His rider was able to ease him down on the run-in last time out and he should not be inconvenienced by further rain. Keith Reveley’s Night In Milan is weighted to confirm form with Mart Lane on their previous meeting at Doncaster. After jumping boldly in front, Night In Milan fought back when challenged and was well on top at the line. Mart Lane finished well beaten in third that day but won next time out in first-time blinkers. Gullinbursti has been running consistently for Emma Lavelle and must have each-way claims but Time For Rupert has been plagued by injuries in recent seasons. He was fifth in the 2012 Cheltenham Gold Cup but has only raced twice since, most recently when tailed off in a hurdle race at Ascot. The Druids Nephew ran well last time for Andy Turnell and has been supported in the ante-post market whilst Baile Anrai represents the stable of first-season trainer Harry Skelton. Roberto Goldback would have a chance on his best form but he has not shown that since having his first outing for Nicky Henderson in November 2012.